A £20,000 reward has been offered to trace the sick burglars who held a machete to the throat of an eight-week-old baby boy. The baby’s father, a prominent wealthy businessman, spoke out for the first time today about the raid on his Sherington mansion. Three masked men burst into his home late at night while he was dozing in front of the TV downstairs. They threatened him with a crowbar and demanded the £20,000 Rolex watch from his wrist. Two of the crooks then went upstairs where the man’s 31-year-old partner was in a bedroom with the baby. They held the 2ft long machete against the tot’s throat until the terrified mum handed over her Rolex watch too. The silver machete was the same length as the tiny baby. “Any person that holds a 24 inch Machete to the throat of a eight week old deserves to feel the full weight of the law,” said the 59-year-old businessman. He was powerless to help his partner and son because one of the crooks stayed with him, guarding him with a crowbar. A 13-year-old girl was also in the house at the time. 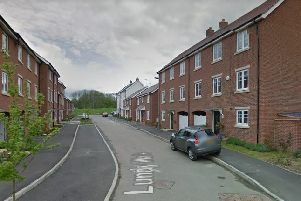 The mum was on the phone to a friend or family member when the two men burst into her bedroom. She was able to scream ‘call the police’ down the phone. The crooks snatched her watch, a Canon camera and a Louis Vuitton handbag, containg a purse and keys to a Rolls Royce car, before making their escape. “If she had not been on the phone at the time and managed to raise the alarm, then goodness knows what could have happened,” said a spokesman for the family. “The men seemed to know all about the Rolex watches. After taking the first one, they asked “where’s the other one?” They must have been watching the family, which is a disturbing thought,” he added. Two of the offenders are described as white and one was of Asian appearance. They were all wearing black face coverings, black clothing, black shoes and gloves. Police are appealing for information about the aggravated burglary, which happened in Bedford Road at around 10.45pm on Thursday 27 October. They particularly want to hear from anybody who has been offered the distinctive watches. One is an 18 carat gold Rolex Daytona worth £26,750 and the other is a £20,000 Rolex Oyster watch with a black face and diamonds and an 18 carat yellow gold strap. Call police on 101, quoting reference number 43180328695, if you can help. Alternatively call Crimestoppers anonymously on 0800 555 111 or visit https://www.thamesvalley.police.uk/tua/tell-us-about/cor/tell-us-about-existing-case-report/ and provide the details there.